David Whitely aka ‘Sideman’ is a radio presenter on BBC radio 1 alongside Charlie Sloth in their show “the 8th” which has been described as the most edgy and unconventional show on the station which attracts millions of listeners. His online comedy videos have raked up millions of views online and attracted nationwide news coverage for his parody of a Nike advert. He is an all round entertainer and hosts many sold shows as well as performing Stand Up alongside some of the UKs biggest comics such as Richard Blackwood, Aurie Styla, Judi Love, Kane Brown to name a few, having only started 2 years ago. 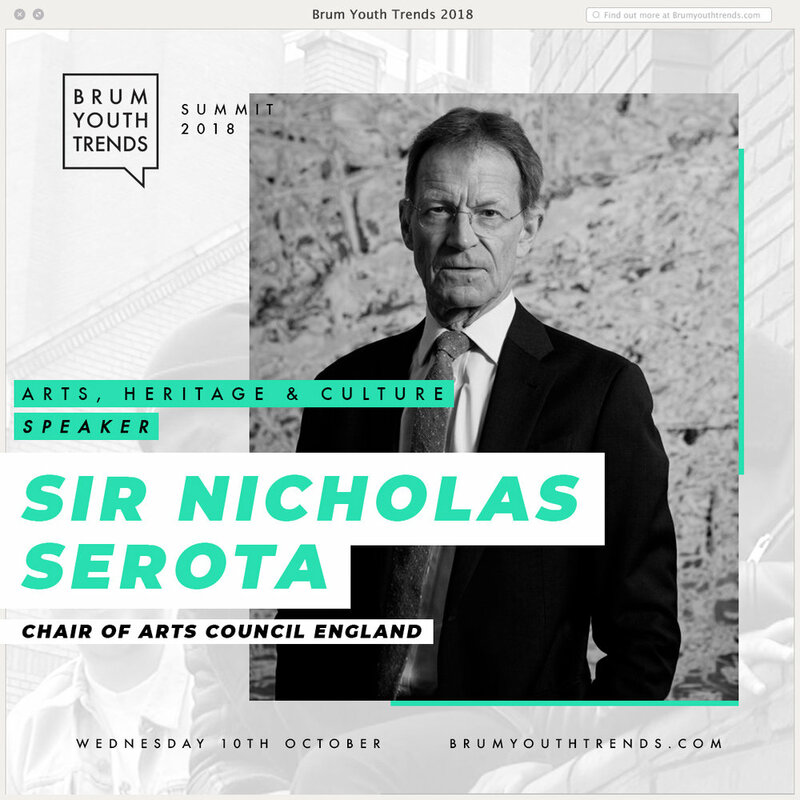 Nicholas Serota has been Chair of Arts Council England since February 2017 and is a member of the Board of the BBC. He was Director of Tate between 1988 and 2017. During this period Tate opened Tate St Ives (1993) and Tate Modern (2000 & 2016), redefining the Millbank building as Tate Britain (2000). Tate created the Plus Tate network with 35 regional galleries across the UK. CEO of responsible technology think tank Doteveryone. She has spent the last 20 years turning emerging technology into products and services, and helped many organisations adapt to the digital world. She has worked as the Head of Digital Media at the Royal Opera House, Project Manager of a large-scale storytelling project at the V&A, Interactive Editor at Endemol, Teens Editor at the BBC, as well as working for Microsoft and the Encyclopaedia Britannica, and as a consultant with large service organisations in finance, energy, healthcare and the third sector. She is also the founder of Culture Hack Day, co-founder of arts innovation agency Caper and a trustee of the Fawcett Society. An active protagonist in the work to understand, develop and grow access to opportunities, skills & experiences for creative citizens throughout Birmingham. After graduating from Birmingham's School of Architecture & Design in 2013, Andre has organised, managed and co-curated a number of low-barrier opportunities for creative individuals & groups to increase their sense of agency and/ or build sustainable businesses: from Blacktapestudios - Coworking Production Space, 2014-2016; to PopIN UK’s - 6 month fusion pop-up store, 2016. Andre’s current venture KIONDO, continues his theme of access over ownership by bridging the gap between designers and the everyday individual’s creative intelligence. Zeddie Lawal, Community Developer at Free Radical, graduated in Drama and Theatre Arts from the University of Birmingham with at 2.1. Since arriving in Birmingham in 2013, she has developed her unique performance style which integrates music and spoken word. This is demonstrated through her band Transits who have performed at Birmingham Pride and at the Birmingham Hippodrome. She has been apart of Birmingham REP Actors Foundry, and working closely with Alexander Zeldin and TAWALA studio firsts working on her solo play. She was also a member on the ASTONish cultural leadership programme which has enabled her to shape and guide her facilitation with a broad range of audiences. Brigid was elected the local councillor for Selly Oak Ward in May 2011 and took on the Cabinet portfolio for Children and Family Services in 2012. In 2017 at the age of 30 she was elected as Deputy Leader of the Council. As Cabinet Member she helped drive improvements in one of the country’s most challenged and scrutinised Children’s Services departments and overhauled the Education Department. Working in the largest metropolitan authority in England, Brigid’s agenda in her new role is to harness the power of partners across Birmingham to drive the change our city needs, whilst using her extensive experience to help the wider council’s improvement agenda. Kari Lawler was accepted onto the Entrepreneurs for the Future (e4f) incubator at just 14 years old, where she became the youngest ever start-up, entrepreneur on the Innovation Birmingham campus. Now, at 15 years old and with the guidance and mentorship from Barclays Eagle Labs she is utilising this knowledge to help start-ups and SMEs understand and deploy AI within their businesses, through education, development and training. Kari’s rapid rise within the tech world has been acknowledged with multiple awards, including her winning the coveted UK Space Agency SatelLife challenge ‘18, for her AI proposal. Being named one of ten top teen female tech talents in the UK through the InspiringJuniors UK competition. Plus, most recently being the youngest ever nominee and winner of the Greater Birmingham Chamber of Commerce Future Face 2018 award for Technology & Innovation. Sean Russell is Superintendent within West Midlands Police. He is currently the Force lead for Mental Health and has been recently appointed as the Director for Implementation of the Mental Health Commission Action plan and is working across the West Midlands Combined Authority footprint to reduce the burden of mental ill health, improve people’s lives and encourage healthier more productive communities. Sean has a keen interest in policing Mental Health and the impact this has for both the service user and the police. He has spent most of his 24 years’ service within Birmingham Command Units in operational roles. Sean graduated with an MBA from the University of Birmingham and has recently completed his PGDip in Forensic Mental Health. 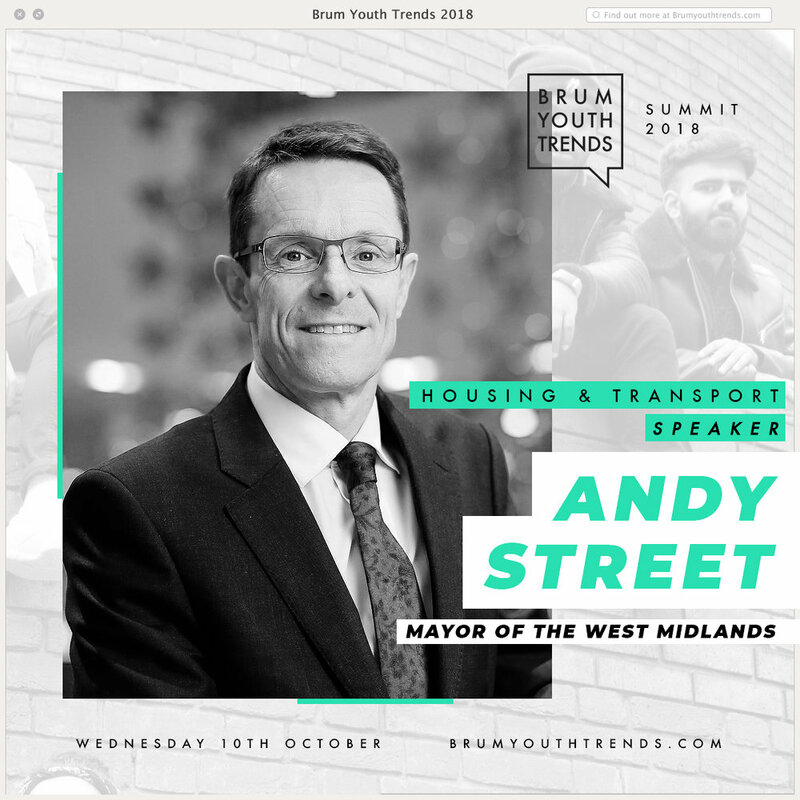 "I am thrilled to be part of the Brum Youth Trends Summit and I urge you all to attend. It is an incredibly important and valuable opportunity for the city's businesses, institutions and policy makers to listen to the young people that make up 40% of Birmingham's population. Beatfreeks have taken on this research in order to capture insight that we can proactively use to develop our city, ensuring we are making space for the next generation to thrive. This research is key if we want to continue to be at the forefront of innovation." Sophie is a founding team member of Birmingham PR agency Story Comms. Sophie is a communications specialist, complex copywriter, digital strategist and stakeholder manager. 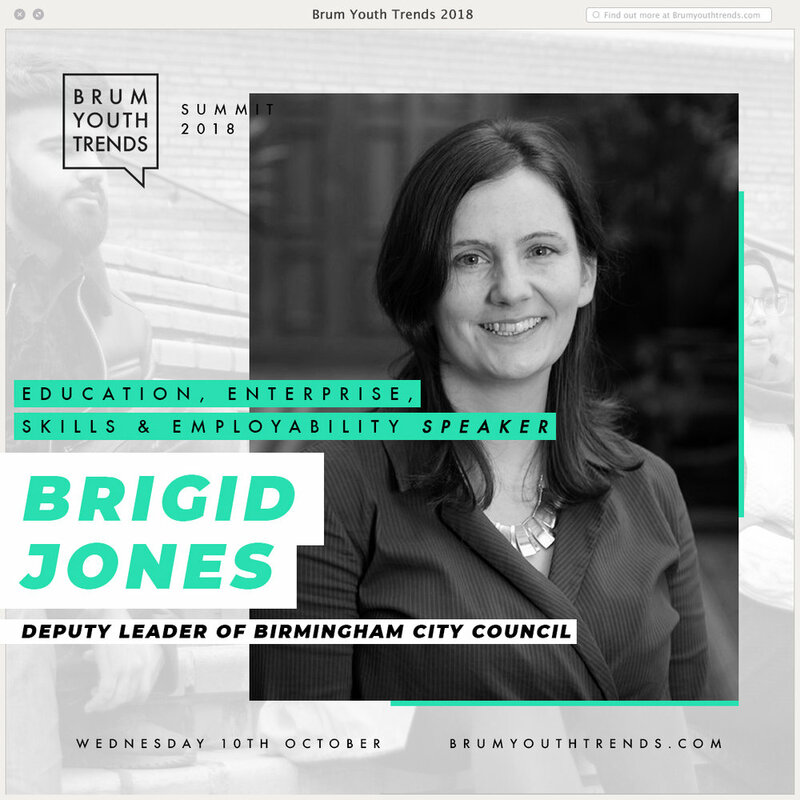 She was recently appointed as the UK’s first Director for Young People on the Greater Birmingham and Solihull LEP board, where she is responsible for engaging and galvanising the population of 18-30s in the city region. She is also marketing lead for the Infrastructure Committee at Birmingham Future – where she supports the delivery of a range of events and initiatives that showcase the city’s changing landscape. Sophie was recently recognised as one of Birmingham's 30 Under 30 and in 2016, was named the Birmingham Chamber of Commerce Future Face of Communications. Tee Cee currently works for the BAFTA award winning Children’s Channel ‘CBBC’ as a Presenter and Digital Researcher. She formerly trained as a Broadcast Assistant and worked for the award winning radio station BBC West Midlands. At age 16 she became the self-published Author of a young adult fiction book titled ‘Snow Black, the Seven Rastas’ and Other Short Stories and was dubbed a ‘Black History Month Hero’ by Birmingham primary schools. Off camera, Tee Cee can be found inspiring the next generation through original short form content she directs and produces for BBC Children’s digital platforms, public speaking, vlogging and empowering young women through original lifestyle content through her own colourful platform ‘Skool Girl Online’ which she launched aged 19. Amardeep has a multi-award winning portfolio including investigations into radical extremists, terrorism, crime and gang networks, and social affairs. Regular contributor of hard news and features to national and international press and broadcast media including flagship programmes like BBC's Panorama, File on Four, Channel Four News and Dispatches. Amardeep has extensive reporting experience covering the sub continent with specialist knowledge of Afghanistan, Pakistan and its remote tribal areas and India. Fluent in Punjabi, Hindi and Urdu. He specialises in providing detailed and complex investigations for national and international print and broadcast media covering crime, terrorism, radical extremism and general social affairs. 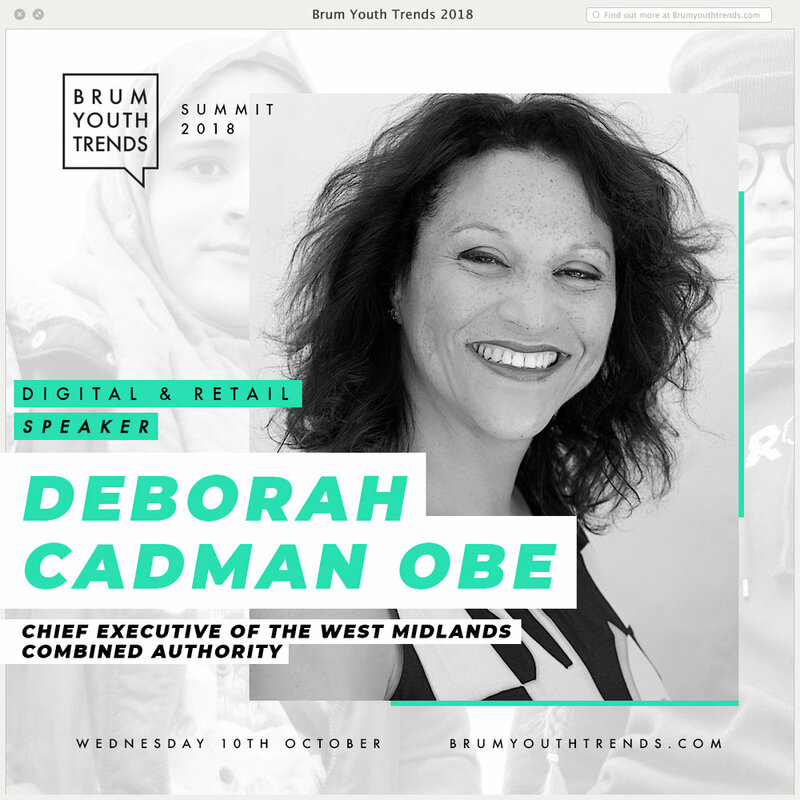 Deborah became Chief Executive of the West Midlands Combined Authority in September 2017, following a long and distinguished career in public service. After gaining a degree in politics, she began her career in 1984 with the London Borough of Newham, before moving to Birmingham City Council where she worked on major regeneration projects and gained a master’s degree in economics. She is a trustee of the Joseph Rowntree Trust and Joseph Rowntree Housing Foundation and as a dedicated and passionate female advocate at the forefront of the public sector, Deborah recently won the First Women Award for Public Service. Deborah is listed in Local Government Chronicle’s ‘100 Most Influential in the Sector’. Deborah was awarded an OBE in 2006 for services to local government. "I am Muhammad Waleed Khan. I am one of the few survivor of the APS school attack that took place on 16th December 2014 in Peshawar Pakistan. In that attack I was shot with 8 bullets. 6 bullets on my face and one on leg and one on my hand. I lost all my friends and teachers in the attack. After going through all this I never give up. Today I am even more stronger and determined than ever. Currently I am in UK and going under treatment. I am also studying here at the University of Birmingham School. I am also member of UK youth parliament. I am the student guild at my school. I am the captain of my school cricket team. I also go to different schools and give motivational speeches. My biggest aim of life is to make a change and help children around the world who are suffering from traumatic situations." Amna Akhtar is the Co-Founder and Creative Director of GirlDreamer and the Founder of her own independent fashion label 'Almari by Amna'. Growing up as a first generation immigrant from a working class family in inner-city Birmingham, Amna worked her way through the business world with no formal training and no degree. Her self-taught attitude has earned her coverage on the BBC, Channel 4 and ITV, she then went on to become a TEDx speaker and was featured in British Vogue. She is also responsible for creating the UK’s first women of colour longboarding crew to use sport as a tool for social change, which has now become an award-nominated documentary film. Having worked in agency and in-house roles for over eight years, Tara set up EAST VILLAGE. back in 2013. Specialising in PR, marketing and events for retail, leisure and hospitality brands, EAST VILLAGE. was born out of a desire to create lasting relationships through engaging conversations. Tara wanted to bring her enthusiasm together with experience and build an agency full of people who are passionate about delivering PR with Personality. In just four years, EAST VILLAGE. – which is situated in the heart of Colmore Business District – has become one of the Midlands’ most promising agencies, winning ‘PR Agency of the Year – Birmingham’ at the SME News Awards 2018, ‘Outstanding Small Consultancy (Silver)’ at the CIPR Awards 2017, ‘Small Business of the Year’ at the West Midlands Awards 2017, and being listed as one of Small Business Saturday’s #SmallBiz100 companies. Areas will include: Health/Mental Health, Arts Heritage & Culture, Identity Relationships & Culture, Housing/Transport, Digital/Retail, Education Enterprise Skills & Employability, Digital Tech Public-Space & Communities and Relationship To Brum & Aspirations.